OhGizmo! Lightning Review: The Extreme Q Vaporizer | OhGizmo! The package comes with everything you see in the picture above. Two collection bags, one long tube which they call a “long whip”, two vaporizing bowls, a blown glass stirrer, a remote and a few other accessories. The quality of the machine is good. Acceptable. It’s not on the same level as the Volcano, clearly, but it doesn’t feel cheap. It has rubber feet that prevent it from moving around and a long power cord, allowing you to position it where you want. The tubes are medical grade plastic and the connecting parts are glass. Everything fits snugly and there’s no need to force anything together or apart. The device has an LCD screen that displays the temperature, which you can adjust by 1 degree increments. The way you use it is quite simple: load your herbs in a “cyclone bowl”, place it atop the heating element and wait a couple of minutes for everything to get up to temp. Then you have two choices: use the long whip, or the collection bag. If you take the long whip, it can easily be swivelled 360 degrees and passed around. It’s very social and similar to Shisha (nargyle, hubbly bubbly, etc.) in its usage dynamic. Producing vapor takes a bit of getting used, as you realize that no vapor is produced as long as you don’t circulate any air. Once you understand that, you can vary the thickness of the smoke by controlling the flow of air; slower means thicker vapor and vice versa. 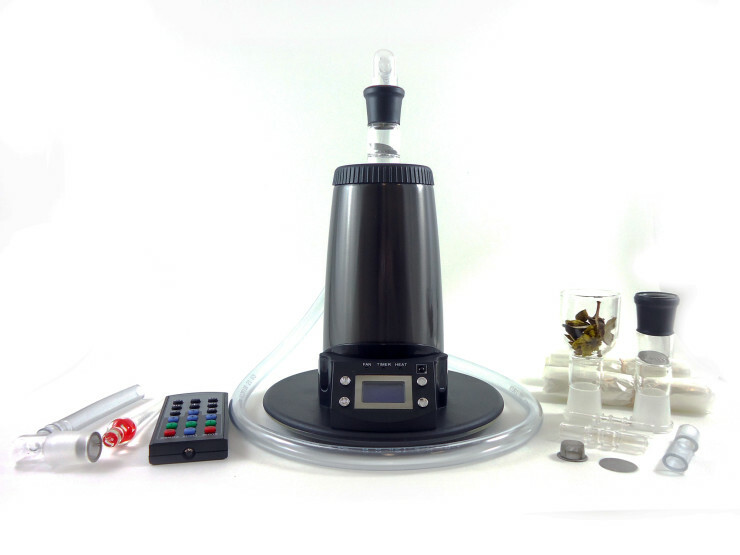 Used in this way the Extreme Q produces a good amount of vapor, although since the ‘cyclone bowl’ itself is relatively small, you don’t produce industrial quantities of it. If you’re a group of 3 to 5 people, you’ll be happy. The other option is to use the collection bag. The device has a pretty quiet 3-speed fan, so once you fit the bag and start it up, it’ll fill up with vapour within a minute. The added advantage of this is that it then becomes somewhat portable, allowing you to walk around your home and share it with anyone who isn’t close to the machine. Better yet, using the remote with it lets you get a bag started without so much as getting off the sofa, and then you can just go pick it up when it’s ready. It’s super convenient and one bowl full of herbs gets you about three to four collection bags worth of vapor. That’s enough for a group of 5 or 6, depending on your usage. Now, for some of the issues. The collection bag needs to be assembled, and this is super complicated. As a matter of fact, you’re going to want to watch this video on how to do it. The instructions provided attempt to be clear, but fail in this regard. But once it’s assembled, you don’t need to do it again. Also, the fact that you’re using glass which gets pretty hot means you have to be very careful when handling everything and the risk for breaking is always present. Storing the Extreme Q when you’re done with it is also complicated given the amount of moving parts, so it would be best left on a table permanently. It does look good and even has a blue LED under the base, which is a nice touch. Finally, if you’re looking for a device that you can enjoy by yourself, the Extreme Q may be overkill. You’ll end up making too much vapor, at least for this user. It’s more of a party device. It doesn’t make as much vapor as a Volcano, the fit and finish isn’t as “upscale” as the Volcano but… it does make enough for a group of 3 to 5 people. It does look good. It is consistent in its operation. It’s quiet. It has a very convenient remote. There are very few things to dislike and one very, very good thing to like: the price. At $200, it’s a steal. Camelbak Big Bite Valves fit the bag perfectly, so you don’t have to hold your thumb over the opening.